Barry was born in Chemainus, BC, and passed away peacefully at his home in Christina Lake after a four‑and‑a‑half month battle with cancer. He is predeceased by his parents, George and Emma, and stepfather Robert Turnbull. 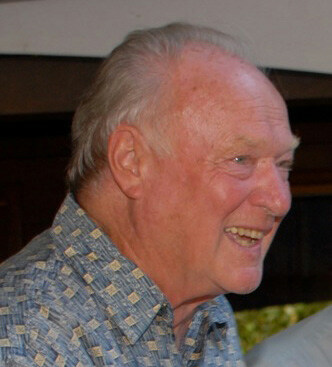 He is survived by his wife of 57 years, Peggy; children Doug, David (Marjory) and Monica (Jeffrey); grandchildren James, Robb, and Lex Phillips, and Kayden and Jenna Sim; and two step grandchildren, Aaron and Shane Roberts. Barry attended elementary school in Chemainus and Christina Lake and graduated from Grand Forks Secondary School. After graduating from UBC, he completed a year of medical school. Barry moved back to Grand Forks, working as a pharmacist for Jack Acres, later becoming a partner, and eventually purchasing the business. Some years later, he started the pharmacy at the Boundary Hospital. After a successful career of 35 years, he retired in 1993. During his working and retirement life he was one of the co‑founders of the Christina Lake Golf Course, was an active participant in the local Trap Club and Curling Club, and was a Cub Scout leader. He was a member of Harmony Lodge No. 37 and received his 50‑year pin. He was an avid fisherman, enjoying salmon fishing on the West Coast and subsequently deep‑sea fishing in Mexico. He enjoyed hunting in his early years, and later became a passionate gardener, baker, and Sudoku player. Huckleberry picking was a favourite family ritual in the summers. After a little push from Peggy, he became interested in world travelling – New Zealand and Africa were two of his most memorable trips. He lived life richly and will be greatly missed by family and friends. Donations to the Phoenix Foundation in memory of Barry (or a charity of your choice) are gratefully appreciated.